This product review is the strangest product review I have ever done… and here’s why. The picture you see of that product to the left is not what I’m reviewing. No, I’m reviewing the concept of this product. The creator of this C No Evil product contacted me about this product and I took a look at the website and youtube videos and I really liked what I saw. So I emailed back to ask if I could get one to review. I got no reply. I then emailed back a couple weeks later to ask again if I could get one to review but again I got no reply. Since this review the creator of this product (Ron Lampman) contacted me to say he did respond to my emails but they must have gotten lost in cyberspace. That happens more than you’d believe so this review is in no way discrediting Ron. He seems a stand up guy. Anyway, I forgot about it and then one day I was reading about a guy talking about how he swings so much better when a ball is not in front of him. Upon reading that I remembered this product, because here’s how it works. 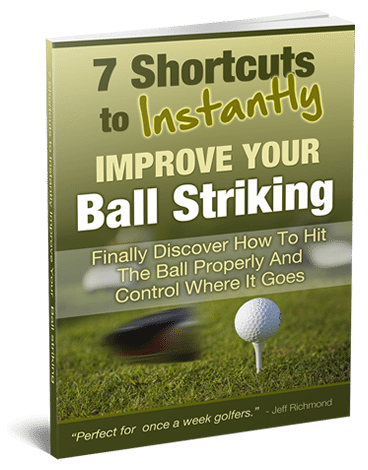 As a golf coach I know all too well how golfers often struggle when the ball is in front of them. For some reason the golf ball seems to have almost “magical powers” on us golfers. And one of the best things as a coach I can get my students to do is hit putts with their eyes closed. But there’s a big downfall with that in that when the time comes to play real golf you won’t putt with your eyes closed. So I saw a great opportunity with this product for golfers to feel like they would be hitting a normal shot (i.e. they have their eyes open) but the ball is out of sight. Now because I was not sent one of these to review I can’t comment directly on the product because I haven’t used it. And because of that I’m not sure if there’s more to it than what is said on the website and in youtube videos. So I’m really only reviewing the concept. And on that note, it occurred to me that I could just make up something similar to this product. To do this I got out some books and a DVD case and set it up so that the ball was under the DVD case and the dvd case was held in place by the books (I have also used to cans from my kitchen and placed the dvd case between the two cans standing one on top of the other). I then started using my home made training aid for putting and then chipping, and I loved it. The feeling of “not hitting” the ball is great. It definitely allows you to feel like you’re swinging through the ball rather than hitting the ball. But there’s one problem I found with doing this and that is I didn’t know where the ball was when I setup to it. 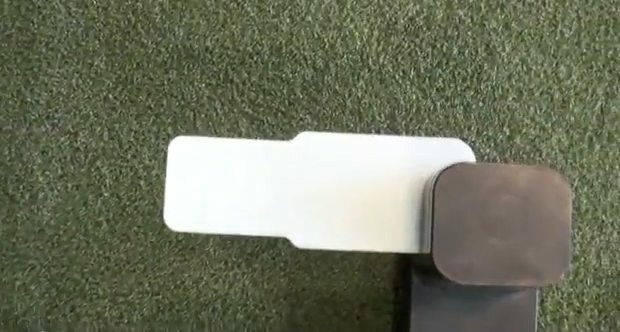 So if I was to do more practice like this I would mark the place on the ground where the ball is so I can just setup to the ball without having to bend down to see if the club is behind the ball. So the practice concept behind this C No Evil training aid is awesome. 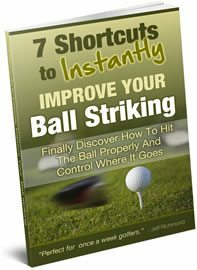 I highly recommend you try practicing like this – especially if you think you swing better when a ball is not in front of you.